Officials from the federal Bureau of Alcohol, Tobacco, Firearms and Explosives say the three people who died in a car explosion in downtown Allentown, Pennsylvania, knew each other. ATF special agent in charge Don Robinson said at a news conference Monday afternoon that he wants to dispel rumors that a bystander was killed in the blast, but he would not discuss details of the incident. The Lehigh Valley coroner identified the three people who were killed as 26-year-old Jacob Schmoyer, his 2-year-old son Jonathan Schmoyer and 66-year-old David Hallman, who was a friend of the father. The coroner says all three died of traumatic injuries from the explosion. Officials would not discuss a motive or how the explosion occurred. Investigators have returned to the scene of a car explosion in downtown Allentown that killed at least three people. About 30 investigators are combing the scene Monday. Most of them appear to be from the federal Bureau of Alcohol, Tobacco, Firearms and Explosives. Some are wearing hazmat suits. Three people were found dead after the Saturday night blast. Autopsies are being conducted Monday. Officials plan to release their names after their identities are confirmed and their families are notified. Officials are treating the explosion as a crime and say it’s believed the perpetrator is among the dead. 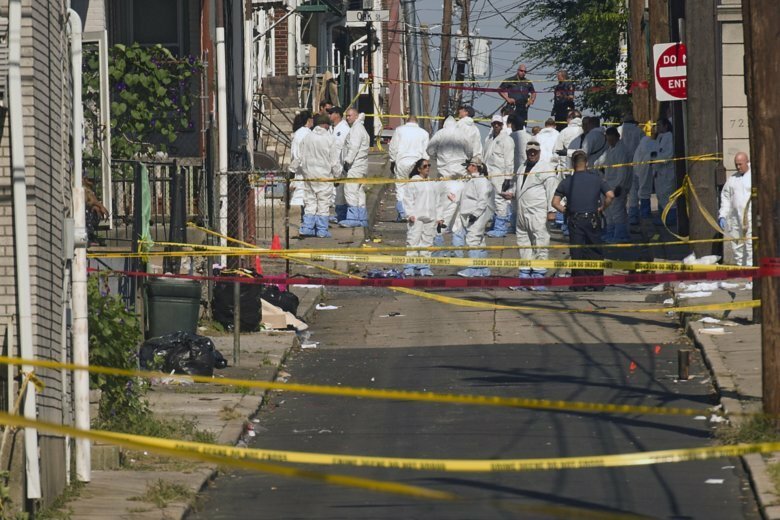 Autopsies are planned Monday on the bodies of three people found dead after a car explosion on a downtown street in Allentown, Pennsylvania, in what authorities called a “criminal incident” being probed by federal, state and local authorities. Lehigh County Coroner Scott Grim says three males were found dead after the 9:30 p.m. Saturday blast. He says he will probably be able to release the names after their identities are confirmed and their families notified. The federal Bureau of Alcohol, Tobacco, Firearms and Explosives is leading the investigation along with the FBI, state police, and city and county authorities. Officials say the perpetrator was likely killed and there is no ongoing threat. Authorities are seeking the public’s help and are asking anyone with information to call the ATF.